One of INSEAD’s core strengths is its diverse community. Students are encouraged to understand different perspectives and are offered tools to thrive in an ever-changing global business ecosystem through a curriculum that leverages personal differences and conflict to achieve intellectual and professional growth. Alumni continue to strive to be effective leaders in their chosen field and to advance their professional and personal goals. Most alumni rely on their INSEAD experience and alumni connections to support their ongoing efforts. INSEAD’s community is unique. As one of nine distinguished alumni panelists who shared a round of special toasts to INSEAD at the Global INSEAD Day celebrations in New York City on 12 September, alumna Ripa Rashid MBA‘00D shared that at INSEAD “I found my people”. This statement was met with a collective nod in the room of about 140 alumni. If that sentence resonates with you, it may be because you too found your people at INSEAD, through a uniquely diverse community that fit your specific needs. The value of female leadership and participation in the workforce has been a hot topic for good reason. The positive contribution that female employees make to organisational success is not only a concept that “exponential organisations” and leaders’ support, but one that INSEAD corroborates, as do the top MBA programmes throughout the world. 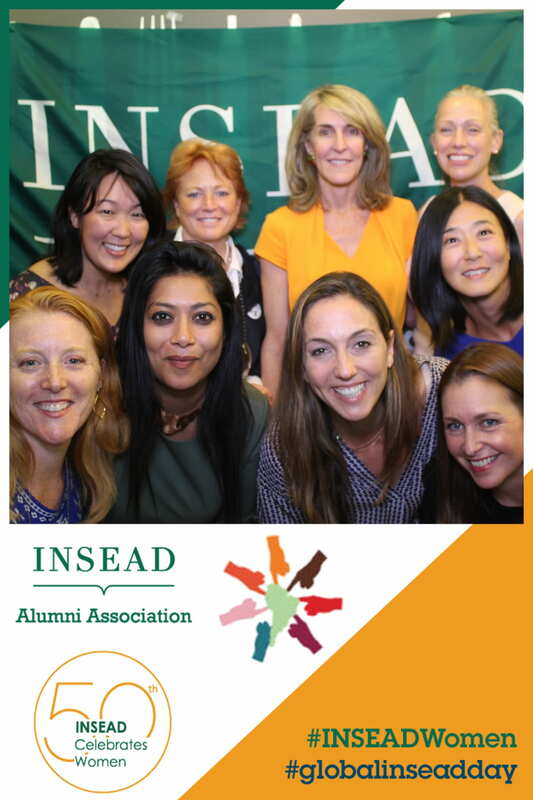 INSEAD’s women MBA and EMBA students and alumnae serve to strengthen the school’s diverse community. However, with women representing only 34% of current MBA students, and 17% of alumni, there is still much work to do to achieve true gender equity in business, foster an effective alumni support network and remain competitive as a top global MBA. Pioneering alumnae have led regional INSEAD women in business clubs that have been active on and off for years in the US, Europe, Singapore and Brazil. 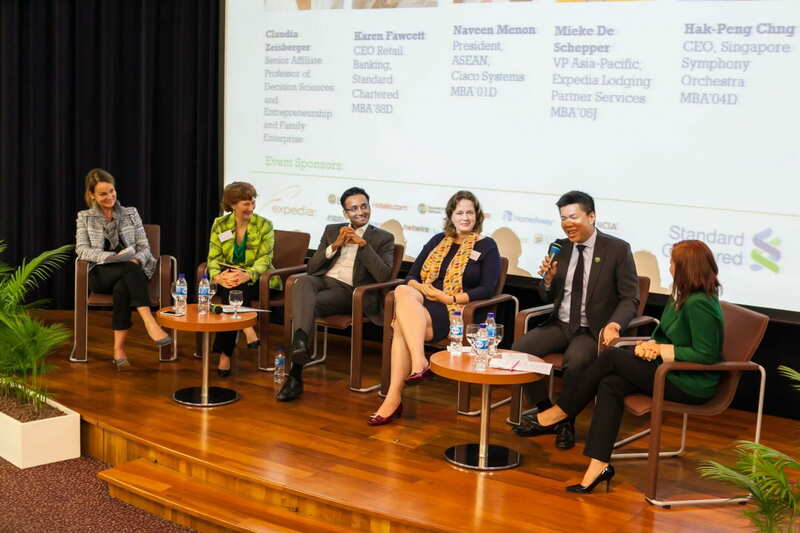 The INSEAD Women in Business Global Club (IWiB) was officially launched in November 2016 and serves to empower and connect the global INSEAD alumnae and the entire alumni community. Our goal is to champion women in business, in both traditional and diverse career paths, and to accelerate gender balance and more inclusive leadership and culture in organisations. A key tenet of our approach is to engage men as frontline advocates for equality and excellence in leadership. The IWiB Global Club provides guidance, inspirational ideas, and the tools to create networking opportunities, continued learning, career development and career transitioning or “on-ramping” after a career break for alumni. The club joined forces with the School in celebrating the 50th anniversary of the first women graduating from INSEAD in 2017 and 2018. In addition to many successful Global INSEAD Day/iW50 celebrations, recent examples of local WiB Global Club lead events include Singapore’s “Managing Talent in the Digital Economy” panel discussion, San Francisco’s kick-off of their regional IWiB Club Council to gather ideas about its purpose and goals, Switzerland’s launch of a mentoring programme, and Belgium’s “Experiential Workshops” conducted by experts on discrimination and stereotyping. Male and female alumni were able to take away concrete tools to address these issues in the workplace and apply to their own organisations and initiatives. We are also working to support the Alumni Forum leadership as they plan and execute these important INSEAD alumni events around the globe. In addition, the US and German chapters of the IWiB Global Club have initiated fundraising for the INSEAD Women’s Scholarship, and plan to encourage the initiative in other regions or interested NAAs. The IWiB Global Club leadership will work in close collaboration with the National Alumni Associations (NAAs). It is led by three Co-Presidents in the US, Europe, and Asia, and co-ed ExCo members represent the global alumnae base. The Club joins the collection of Global Clubs that were established to “strengthen the bond between alumni” as we work to deepen alumni engagement with these topic-specific groups. The IWiB Global Club leadership is thrilled to receive support from the Office of Alumni Relations and the IAA and successfully collaborated to plan and execute INSEAD’s launch of a year-long celebration of women at INSEAD on 12 September, Global INSEAD Day. The “iW50 campaign” celebrates 50 years of women at INSEAD. With this celebration, INSEAD reaffirmed its dedication to expanding its effort to reach gender equality, sustain the professional achievements of women and celebrate women alumni. Today INSEAD is proud to have its highest-ever proportion of female students, faculty and board members. Thank you to the following NAAs, NACs and Global Clubs that hosted GID/iW50 events: Australia & New Zealand, Belgium, Brazil, Bulgaria, Canada, China, Cyprus, France, Finland, Germany, Greece, Hong Kong, Indonesia, Ireland, Japan, Lebanon, Malaysia, Mexico, Netherlands, Nigeria, Norway, Pakistan, Peru, Philippines, Portugal, Romania, Singapore, Spain, Switzerland, Thailand, UK, US, United Arab Emirates and the Global Women and Business Club. We encourage both men and women to join the club. In addition, please reach out to us to share your thoughts, ideas, and questions. We welcome your input to further the value of our global network. If you have questions, please contact Co-Presidents Liana Slater MBA’00J (Americas), Annika Rahm MBA‘16D (Europe/MEA), and Katarina Uherova Hasbani EMBA‘14D (Asia Pacific), and Ex-Co members Sophie Bertin MBA’02J, Dirk Luyten MBA’89J, Dheeraj Motwani MBA’09J and Julie Nazerali EMBA‘14D.